Isabel Perez-Farfante; Brian Kensley, National Museum of Natural History, for: "1997. Penaeoid and sergestoid shrimps and prawns of the world. Keys and diagnoses for the families and genera. Vol. 175. Editions du Museum national d'Histoire naturelle." 1997. 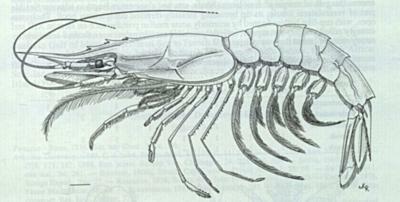 Penaeoid and sergestoid shrimps and prawns of the world. Keys and diagnoses for the families and genera. Vol. 175. Editions du Museum national d'Histoire naturelle. This media file was first entered in MorphoBank as M332989 in P1134. This project which the media file was first entered has since been deleted. It has also been used in: P2282 as M400502.